Jack and the Beanstalk Slot is a five reels slot with three rows and 20 paylines. The game was released by Netent and is based on the eponymous fairy tale. Jack is the main character who experiences adventures in the land of the giants. From 20p you can start the reels on Jack and the Beanstalk Slot. The maximum bet is £ 100 and you can play on any device including your smart phone. In addition to beautiful visual effects, there are also good bonus features: a Walking Wilds feature in the base game and a Free Spins feature with Treasure Collection. 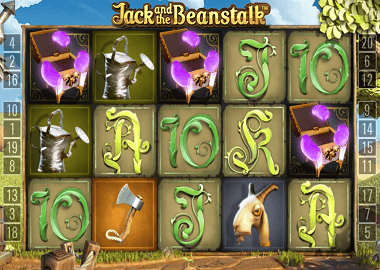 Symbols and Payouts: The symbols of Jack and the Beanstalk Slot are beautifully decorated. There are playing cards symbols and theme related symbols. The playing cards 10, J, Q, K and A pay up to 100x your bet. Theme icons include a watering can, an ax, a unicorn, two giants and Jack himself. The Jack symbol is also the most valuable symbol and pays up to 1000x your bet. The Scatter symbol is the treasure chest and the Jack and the Beanstalk logo is the Walking Wild symbol. Walking Wilds feature: In addition to the Free Spins feature, the Walking Wilds are the main attraction of the game. When one of the Walking Wilds lands on your reels, you get a re-spin. The game then moves one position from right to left. During the feature, more wild symbols land on your reels: a sack of gold, a hen and a harp. Every time you get a game, you win with a 3x multiplier. You can trigger the Walking Wild feature in the Base Game and Free Spins feature. Free Spins feature: The Free Spins feature is the height point of the game. With three Scatter Treasure Chests symbols you trigger 10 Free Spins. You can re-trigger the feature with three more scatters and get another 5 free spins. If during the Free Spins key symbols land on reel 5 you trigger these wild features: 2 Stacked Money Bags (3 key symbols), 3 Stacked Golden Hens (6 keys symbols) or the Expanding Golden Harps (9 key symbols). The wild symbols remain on your reels until the feature finishes. The Jack and the Beanstalk Slot is one of the most popular slots from Net Entertainment. The slot is invariably available in every online casino with Netent games. You can also play the Jack and the Beanstalk slot here for free. Click on the banner above or visit our Netent page. There you will find more top games from the Swedish manufacturer. Below are our best recommendations for Netent casinos. In the Energy Casino and the LVbet Casino you can redeem free spins – just register and play for free! Generally you always get a welcome bonus and free spins!